he Union with England, of 1707, having been fully as much of a confederative as incorporating kind, and of such a nature as to leave Scotland its chief institutions, Edinburgh did not altogether lose the character of a capital on that event being consummated, and till our own times it continues the seat of those mutilated national establishments which regulate the affairs of the northern portion of the island of Great Britain. The clamours of the Scotch on the occasion of the Union induced the continuance of certain state functionaries in Edinburgh, which experience has pointed out as useless, and for the abolition of whose offices the exigencies of the country have been some time clamorous. In the course of the last hundred years there have been different amendments on the system of local administration in Scotland, yet much remains to be remedied in the abrogation of functionaries whose duties are entirely nominal. Besides a variety of officers of the royal household connected with the metropolis, who enjoy little else than honorary titles, there are several officers of state, who, though nominally belonging to establishments in Edinburgh, and drawing large salaries from government, do not reside in the metropolis. The chief of these functionaries are the Keeper of the Great Seal, the Lord Privy Seal, the Lord Clerk Register, the officers of the Mint, and the Lord Justice General.The duties of these persons are either done by deputies or the substitutes of deputies, or their situations are purely imaginary. For forty years after the Union, the Scottish Secretary of State continued to reside and do duty in Edinburgh; but, being then withdrawn, his office was filled by the Lord Advocate, who is now by implication, as much as by an actual commission, the most important officer of the crown in Scotland. Besides exercising the functions of a public prosecutor (in the room of the aggrieved party) and of a Grand jury, he can order to be seized, on suspicion, any person residing in the country, without being obliged to mention his informer, and can let the accused free at any time up to the period of trial; even, after trial, he stands in the place of Majesty, and can avert the last punishment of the law by restricting the libel to an arbitrary punishment. The Lord Advocate is, moreover, the confidential counsel of the crown in matters concerning Scotland; it is his duty to quell seditious meetings; to take every means for preserving the peace of the kingdom; to have an ever-watchful eye overpopular movements or secret measures inimical to the preservation of the laws, the religion, or the morality of the nation; and in a word, this functionary is the mainspring of the whole executive in the eountry. The Lord Advocate generally resides in Edinburgh, though without any outward show of viceregal authority, and, in order that he may be at liberty to attend parliament, or devote himself to particular departments of his profession, he has a number of deputies to whom he communicates a share of his power. Edinburgh is chiefly distinguished as a capital by being the seat of the College of Justice, which, as has been mentioned, was constituted in 1532, by James V This incorporated body consists of all members intimately connected with the various supreme courts, and comprehends the Judges, (who are declared to be its Senators,) the Faculty of Advocates, Writers to the Signet, Advocates' First Clerks, Clerks to the Judges, Extractors, Keepers of the different departments, and, in a general sense, may be said to engross the principal legal gentlemen in Edinburgh. This influential body at one time possessed some valuable privileges, the most prominent, if not the most profitable of which now remaining, is an exemption from the assessments of the town-council, an immunity originally conceded by the magistracy in order to induce the permanent sitting of the court in Edinburgh. The principal court connected with the College of Justice is the Court of Session, which is the highest civil court in Scotland, and possesses all those peculiar powers exercised in England by the Courts of Chancery, King's Bench, Common Pleas, Admiralty, and others, being both a court of law and equity. It has also a discretionary power. The constitution of the Court of Session, during its continuance of three hundred years, has undergone many alterations, and is now upon an improved model instituted in 1830. There are thirteen Judges, who are separated into the First and Second Divisions. In the former there are six Lords, and in the latter seven. The presiding judge in the First Division is the Lord President, and that of the Second Division is the Lord Justice Clerk, a title which he derives from being co-ordinately the presiding judge of the High Court of Justiciary. The two Divisions form distinct courts, which, except on particular occasions, have no common connexion with each other. In popular phraseology they receive the collective designation of the "Inner House," on account of their meetings being held in inner apartments leading from the "Outer House," or hall of the Parliament House, afterwards to be described. From the First Division are detached two Judges, with the title of Lords Ordinaiy, and from the Second there are detached three. To one or other of these Ordinaries all cases come in the first instance, and, in case of dissatisfaction with their deliverances, the pleas can be appealed into the Inner House, but always to that Division to whose Ordinary the case was primarily carried. The forms of process before the Court of Session have been much simplified in recent times, and by the excellent device of causing parties litigating 1 to say at once all they have to state on the subject (which is called closing the record) at an early stage of the suit, no ease can be long protracted. By an act of the 1st William IV., c. 69, the power of trial by jury is conferred on the Court of Session, to the extent of trying issues as to matters of fact. The assize consists of twelve men, who must be unanimous in their verdict. The presiding judges on jury trials are one or more of the Judges of the Court and a Lord Chief Commissioner. The Court of Session has a winter term of four, (including nearly a month's recess at Christmas) and a summer term of two months. Appeals from its judgments can be carried to the House of Lords. The judges of the Court of Session are, by commission, the judges in this court, and nine of them form a quorum. The Teind Court is one of the most useful judicatures in the country, and is quite peculiar to Scotland. Its duty is strictly that of regulating the stipends of the clergy of the established church, and other matters touching on ecclesiastical polity. The tithes or teinds, which were exigible in Scotland the same as in England, were all commuted by an act of Charles I., and can only be levied from the landholders (not the tenants) in money. Valuations having generally been made of the amount of tithe in the hand of the various land-owners, or heritors, the Teind Court has the power of obliging these persons to pay their proportions of the stipends of the ministers. The clergy have not of themselves the right to exact any of these tithes, and it is only by application to the court that they receive their stipends. When a stipend is once fixed, it cannot be increased till twenty years elapse, when a new application to the court may be made. Should the court think fit, it can thereupon order an additional levy from the land- owners, provided the valued tithes in their possession be not exhausted, for if such should be the case, the stipend can receive no further augmentation from that source. The tithes in Scotland being already exhausted in many of the parishes, the duty of the Teind Court has been much lessened; and from sitting once a-week, it now sits only once a fortnight, arid in time, its meetings will be still more rare. Another branch of the duty of the court is to confirm the decrees of the heritors and church courts, relative to the disjunction or coalition of parishes, or the removal of churches and glebes from one part of the country to another. This judicature, which was instituted in 1672, and whose head station is at Edinburgh, is composed of a president, styled the Lord Justice- Clerk, and five other judges, who are at the same time Lords of Session. At the head of the list of office bearers appears the Lord Justice-General; but this functionary is a mere sinecurist, and the office is to be abolished on the death of the present incumbent. The court sits every Monday during session; and for despatch of business during holidays, &c. Its attention is closely directed to the trial of criminals. In the vacations of the Court of Session, the Commissioners of Justiciary proceed, in small detachments, upon appointed circuits. Commissary Court, — By the act of parliament, which improved the constitution of the courts in 1530, the head consistorial court of Scotland was almost abolished, and now all pleas relative to declarators of marriage, divorce, &c. are carried before the Court of Session. There yet remains, however, a certain number of Commissaries, whose duty consists in granting confirmation of testaments of persons dying abroad, having personal property in Scotland. They have also a special jurisdiction in the shire of Edinburgh, the same as sheriffs in other counties. When the present Commissaries die out, their jurisdiction falls to be executed by the Sheriff of Edinburghshire. This national institution, which was established on its present basis at the Union, exercises two different branches of duty. A Lord Chief Baron and three other Barons form a tribunal which sits four times a-year for about three weeks each time, and determines causes relative to the revenue, brought before them by the solicitors of taxes, customs, excise, stamps, post-office, &c. The practice of this judicature is entirely on the English mode£ Besides acting as judges, the barons have an extensive authority with respect to property falling to the crown by reason of bastardy, escheat, or otherwise, which they have the power of conveying gratuitously to those claiming to be nearest of kin. The second division of the Scottish Exchequer establishment consists of a very extensive ramification of offices for conducting the business connected with the various descriptions of revenue drawn from the country, passing through this channel. Attached to the court is an officer of the crown with the title of King's Remembrancer for Scotland, whose duty consists in secnring all fines payable to the king, found treasure, and property falling to the crown as ultimus hares. This is a judicature which hardly exists except by name; yet, as it holds a place in the list of national establishments in Edinburgh, its constitution requires to be noticed. The office of Lord Lyon was suffered to remain after the Union, but, the place being a sinecure, the duties are performed by two deputies. Anciently, it was the duty of the Lyon King-at-arms to arrange certain state pageants, and to execute the writs of the supreme courts, and in modern times he is authorized to do so still, so far as Scotland is concerned. He is also the supreme judge in armorial bearings. In the execution of these functions, this officer of the crown has the assistance of, and control over, a large body of messengers-at-arms and other officials, among whom are six heralds, and the same number of pursuivants. The fees payable at the Scottish Lyon Office for patents of arms are now the same as those charged by the college of arms in England. Arms without supporters cost £52, 10s. and with supporters £84; but if the patent be granted as a favour, £115, 10s. is the price. The Lord Lyon receives a share of the fees to the amount of £700 a-year; and, altogether his office may produce £1800 annually. It is enjoyed by a Scottish nobleman. The Faculty of Advocates is an association of barristers entitled to plead before the supreme courts, and who act as counsel to litigants. At present it consists of four hundred and thirty members, who are presided over by a Dean, and whose affairs are managed by a council selected from the members, a treasurer, and clerk. The society possesses no charter of incorporation, and it cannot reject any candidate for admission, provided he be capable of undergoing several examinations on the Roman and Scottish Law, and have published and defended a Latin thesis or a title of the Pandects of Justinian. Every member, on being admitted, pays a fee of £200, one half of which goes to support the Library belonging to the Faculty. The society is subject to the authority of the Court of Session, whose judges are chosen from its members. As a considerable number of government offices and other dignities in Scotland — in particular the thirty-three Sheriffships — can only be enjoyed by advocates, there is no profession known in Scotland which holds out, independent of private practice, such an advantageous prospect of settled and lucrative employment. Out of the above number of advocates nearly one half, from old age, change of occupation, or abundance of private fortune, do not take an active share in the business of the courts, and, indeed in many cases merely enjoy the title. At one time, none but those of noble or gentle families were permitted to enter the sacred pale of this transcendent body; but this very invidious principle of exclusion has been destroyed for at least thirty years, and the profession is now open to young men of talents, of whatever parentage they may happen to be. The Faculty of Advocates is one of the most influential bodies in the metropolis, and its members have been mainly instrumental in giving its society that intellectual tone and that taste for literature for which it has long been characterised. The extensive Library of the Faculty will immediately be noticed. This is an incorporated body, who, besides being qualified to conduct cases before the supreme courts, have the sole right of passing papers or warrants under the signet or seal of his Majesty, in order to make them valid. They also act as conveyancers. The affairs of the body are managed by office-bearers, and the members have a professor of conveyancing in the university of Edinburgh. The Writers to the Signet now amount to 670 in number, and form a very important class of the community in Edinburgh. 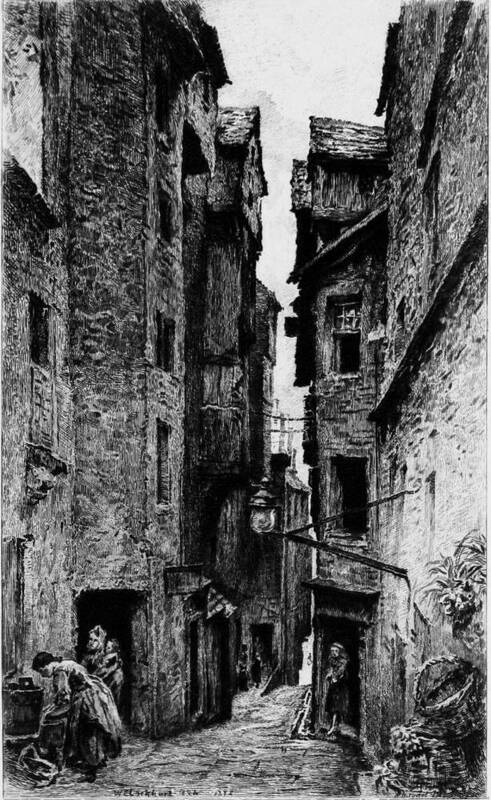 The expense of educating a young man in this branch of the legal profession is very considerable; an apprenticeship for five years, for which a premium of two hundred guineas is paid, and a course of tuition in the Roman and Scots law, as well as conveyancing, being necessary, besides fees of entry on examination. The total expense, including outlay for books, &c. not deducting what may be earned during the term of apprenticeship, is calculated at nearly £700. This respectable body has also a valuable library; and most of the members are associated in supporting a fund for widows. By act of parliament, the capital must he £20,000 for every hundred members. Solicitors before the Supreme Courts — This is a body of attorneys who were incorporated in 1797, and whose privileges are nearly the same as those of the Writers to the Signet, with this great difference, that they have not the power of passing papers under the seal of his Majesty. Its members now amount to 118 in number, and they have office-bearers, a hall of meeting, and a library. Every advocate has liberty to appoint a clerk, who is entitled to act as an attorney in the Supreme Courts, on undergoing the usual examination, and paying certain fees. At present there are only ninety-two of this class of practitioners, many clerks not choosing to take advantage of their privileges, from the expense and risk attending the profession of a lawyer. Having thus presented a brief description of the component parts of that very important institution in Edinburgh, the College of Justice, a notice of those buildings set apart for theuseof the different establishments connected with it may now be appropriately introduced. This edifice, which has been appropriated since the Union as the place of meeting of the supreme courts of Scotland, and now forms one of the most attractive objects in Edinburgh to visitors, is situated on the south and west sides of the Parliament Square. Prior to the year 1640, or thereabouts, the Scottish Estates used to sit, according to circumstances, in the Tolbooth, or other places in the town, and the want of a regular and commodious house of assembly was much felt. On the suggestion of Charles I. the magistrates of Edinburgh, glad to fix the seat of parliament in the city, laid the foundation of a house in 1632, which they finished in 1640 at an expense of £ 11,600 Sterling. The fabric was constructed in the shape of the letter L, the lower limb of the figure being on the south side of the square. The building was 133 feet in length, by ninety-eight broad at the widest part, and sixty at the narrowest. The chief apartment was a great hall in the direction of north and south. From the declivity of the bank on which it stood, while the back part of the building was sixty feet, in height, the front was but forty. This was the room set apart for the meeting of the Estates, who formed one body. The front of the edifice was in good taste, with a certain grandeur in its appearance, and was relieved by some handsome turrets. The entrance was from the angle of the square, and over the door-way were the arms of Scotland, supported by figures of Mercy and Truth, with the inscription, Stant his felicia regna; beneath which was the motto, TJni unionem. In modern times, the Parliament House has been completely disguised by the erection of a new front in the Grecian style, with an arcade below, and open galleries or spaces above, with pillars supporting a continuous cornice. This front was attached in 1807-8, and is not very appropriate in character to the neighbouring buildings. The hall is entered on its east side by a plain door-way and dark lobby in the angle of the building, and it has also undergone various alterations, which certainly are improvements. It extends to the noble length of 122 feet by a breadth of forty-nine, and has a lofty roof of oak, arched and disposed in the same style of open wood-work as that of Westminster Hall, with gilded knobs. Before the Union, the walls were adorned with portraits of the royal family, which, on that event, were given by Queen Anne to the Earl of Mar, by whom they were hung up in Alloa House; but, as that mansion was destroyed by fire in the end of last century, these relics must then have been burnt. Till within the last few years, the walls, however, were decorated with some faded paintings of Queen Anne and others. When the Scottish parliament was in full operation, the throne of the king stood at the south end, beneath the great window, and was an erection of considerable altitude. Along the sides of the room from thence, were the seats of the bishops and nobility, and before these, on each side, were forms, where sat the commissioners of counties and boroughs. In the middle was a long table, at which sat the Lord Clerk Register and his assistants, taking minutes and reading the decisions as delivered by the chancellor. At the tipper end of the table lay the honours or regabla, whose presence was indispensable to the meeting. On a stool, by himself, at one corner of the throne sat the Lord Lyon, whose duty consisted in administering the oaths to the king and the nobility, (the swearing in of the inferior Estates being left to one of the clerks,) in reading important communications to the house, and in calling silence. The bar of the house was at the foot of the table, nearly half-way down the apartment, where also was a pulpit; and beyond this there was an area partitioned off for the use of strangers, and a small gallery for the same purpose. The old furniture of the Parliament House remained on the floor for the better part of a century, and was partly used by the courts of law, which succeeded to the full possession of the apartment. While such was the case, there were, moreover, a number of little booths and stalls fitted up in the northern or public end, where books, trinkets, and other wares were sold, and in one of which there was a species of tavern, where counsel could converse upon cases with their clients. Within the last thirty years there have been several very sweeping alterations in the economy of the hal£ On the east side, on each side of the entrance, is a recess with benches and a small area for the courts of Lords Ordinary. The south end is lighted up by a large window of stained glass, in which is represented Justice with her sword and balance. This is a modern work of art, having been fitted in so lately as 1824. Beneath the window are curtained entrances to two commodious small courtrooms, also of Lords Ordinary, where certain kinds of debates are heard. 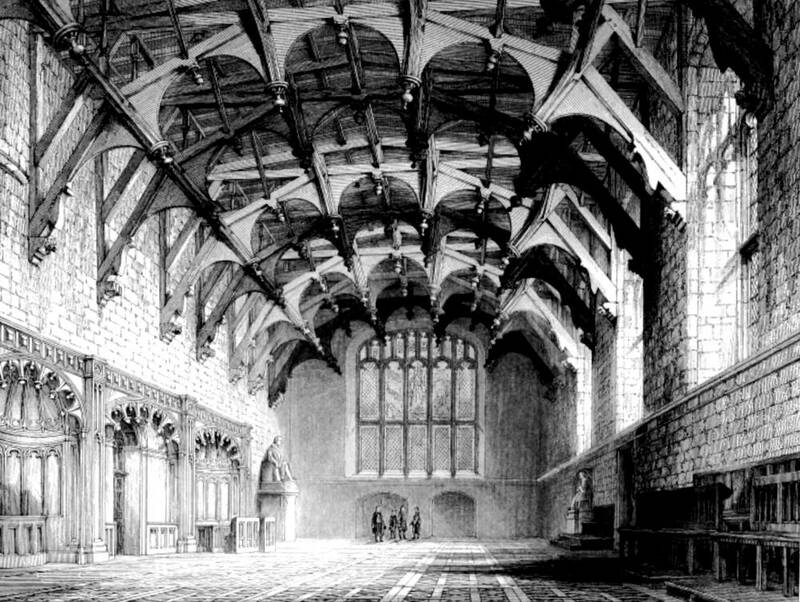 Near the east end of the hall, on the east side, is the court-room of the First Division of the Court of Session. From the opposite side of the hall a similar court-room is erected, being that devoted to the Second Division. These rooms, which were respectively fitted up in 1808 and 1818, are of very moderate dimensions, and as it is in the one or other that the court of Justiciary is held, they are frequently found to be too smal£ In the First Division, behind the chair of the Lord President, is a statue in marble, by Chantrey, of Lord President Blair, son of the author of " The Grave." In the Second Division, behind the chair of the Lord Justice-Clerk, is a marble statue, by Roubiliac, of the Lord President Forbes, in his robes. The hall of the Parliament House, during sessions, exhibits a very busy scene, being the daily resort either for business or lounging of the greater part of the legal profession, besides a multitude of other persons of all ranks. To a stranger the scene appears quite bewildering; and the more so in consequence of the hum which prevails in the busy crowd, who are edging their way to and fro, and the noise made by the perpetual bawling of names by the criers. In a short time, however, the first impression wears off, and the observing stranger will begin to remark that there is method in all that is going forward. By certain well understood rules, the chief classes in the legal profession who resort thither, have appropriate districts on the floor for their promenade, and by this and other arrangements all confusion is avoided. Around the walls there are benches for seats, and here and there the accommodation of tables. Near the north end of the room, in the middle of the floor, a statue, by Chantrey, of the late Lord Viscount Melville, erected in 1818, stands on a pedestal, towering majestically from amidst the living crowd. The apartments used by the Court of Exchequer are in the eastern wing of the Parliament House buildings, with a different entry from that of the Court of Session. The courtroom, which is of very moderate dimensions, is on the second storey, with a light from the roof. Advocates' Close from Robert Louis Stevenson’s Edinburgh. Click on image to enlarge it. Advocates' Library. Connected with the buildings which contain the court-rooms, are certain spacious apartments fitted 'up as the Libraries of the Faculty of Advocates, and of the Writers to the Signet. The principal building adapted to these purposes is of modern erection, in the Grecian style of architecture, and extends westward from the north-west corner of the Parliament House, with an architectural front towards the Lawnmarket. But the larger portion of the books of the Advocates Library are deposited in a series of ten rooms beneath the Parliament House, the public entrance to which is by flights of steps from a door at the north-vest corner of the square. This library was founded in 1682, at the instance of Sir George M'Kenzie, who was at this time Dean of Faculty, and the plan was carried into execution on a small scale, by a fund which had been formed out of the fines of members. At the outset, the Faculty advertised that they wished to purchase rare books, and they thus formed a small collection of volumes. In 1695, the library received a large and valuable accession, by a presentation from William, first Duke of Queensberry, of the library of his deceased son, Lord George Douglas. At this time, the books were lodged in the flat of a house in the Parliament Square, which, by an unfortunate a ccident, took fire, and it was with difficulty that a part of the library could be saved. Next year, the books were removed to an apartment below the Parliament House, from which the library has since extended into a number of other apartments, as above-mentioned. At present, a large new building is in active preparation for this establishment, behind the Parliament House, and which, when finished, will form one of the public edifices on the line of the new street proceeding southward across the Cowgate. Since the period of its institution, the Advocates Library has been undergoing a gradual increase, and it now amounts to a hundred and twenty thousand volumes of printed books, besides a large collection of very valuable manuscripts. By an act of parliament in the reign of Queen Anne, it is enriched by a copy of every book printed in Britain, in common with the other similarly privileged libraries in the united kingdom. About £1000 is also disbursed annually by its proprietors in purchasing other useful or rare books, and the collection is further enhanced in value by copies of bills brought into and passing the House of Commons. Among other curious books shown to visitors, is a manuscript Bible of St. Jerome's translation, believed to have been written in the eleventh century, and which is known to have been used as the conventual copy of the scriptures in the Abbey of Dunfermline; a copy of the first printed Bible, in two volumes, from the press of Faust and Guttenberg; the original Solemn League and Covenant, drawn up in 1580; six copies of the Covenant of 1638; besides a mummy, and some other articles of vertu. Among 'Other valuable manuscripts in the collection, are the whole of the Wodrow MSS. and the chartularies of many of the ancient religious houses. All the manuscripts are preserved in a small room, which is fire proof. The collection of Scottish, English, and Foreign law books, and historical works, is veiy complete. The library is placed under the immediate charge of curators, a keeper, and three assistants. The most praise-worthy characteristic of this institution is the exceeding liberality of its proprietors, in permitting the free entry and study of all persons engaged in literary pursuits, and the politeness of the learned librarian, as well as the unvarying attention shown by the assistant librarians in exhibiting those books which may be required. When we compare the system of exclusion which prevails in other establishments of the kind, with the liberal procedure so peculiar to the Library of the Faculty of Advocates, we shall find that this is the only collection of books in the country which deserves to be called Nationa£ The works of a historical nature are arranged in the long room above the Library of the Writers to the Signet. This apartment is of very elegant proportions, having a range of Corinthian pillars on each side, with a dome in the centre, and is perhaps the most handsome room of the size in Scotland. It was sold some years ago to the Writers to the Signet. The Library of the Writers to the Signet is now a large and very excellent collection, of a professional and general nature, and is daily on the increase, by the addition of the best new works. A library of a similar nature, but of small extent, belongs to the Solicitors in the Supreme Courts, and is at present lodged in apartments in the buildings of the Royal Exchange. * In the counties of York and Middlesex there are registries on a similar plan, and an intelligent member of parliament has been some time agitating the propriety of 3 General Register House for the whole of England. * The most remarkable public document in the collection is the Scottish copy of the Articles of the Union between England and Scotland, with the Act of Ratification of the same. Both consist of several large leaves of vellum, bound in a volume, and highly illuminated with devices in colours and a miniature of Queen Anne. the felicity of its situation, as well as its tasteful design, it has a much better appearance than any other public building in Edinburgh. The internal arrangements of the house lately made by Thomas Thomson, Esq. Depute- Clerk- Register, are as admirable as its outward aspect. It is disposed in nearly a hundred small arched apartments entering from long corridors on both flats, and though heated by flues, is from the construction proof against fire. Besides the small rooms, which are chiefly devoted to the use of functionaries connected with the supreme courts, there are larger apartments for holding registers. The principal library is in the centre building, which is covered with books from the floor to the summit, the higher shelves being approachable by a railed gallery half way up. From this spacious apartment, which is lighted from the roof, an entrance is obtained to twenty-three subsidiary rooms, all used for storing up papers. The whole establishment is under the immediate management of the Depute- clerk Register, and is supported by government. Till within the last two years [i.e., since 1836] there was a regularly constituted Board of Excise for Scotland, which had been established in Edinburgh since the period of the Union. The inutility, cumbersomeness, and expense of such an establishment having been considered, the Board was dissolved, and now the local matters touching the Excise are conducted by a comptroller and two deputy comptrollers, and some other officials in subordinate situations. The building appropriated to the reduced establishment continues to be that which was formerly in use. It is a handsome plain edifice of three stories, situated within the pleasure- ground in Drummond Place, and is that which was at one time occupied by General Scott, already alluded to under the name of Bellevue. This establishment has been reduced in a similar manner, and the department of the Customs is under a receiver-general, and comptroller-general, with other functionaries, who are subordinate to the Board in London. The office has been transferred to Leith. The business of this establishment is conducted by a comptroller and his assistant, with five clerks and a solicitor, besides several surveyors. The office is accommodated in a house in Prince's Street. The department of the Stamp Office has been very much reduced within these few years, and is now placed on a limited footing. It is subordinate to the Board of Stamps in London, and is administered by a head distributor and collector, a comptroller, a solicitor, and a variety of clerks. Newspapers are now stamped by this establishment; but other stamps are still executed in London. The mode of selling the stamps to the public is as absurd and intricate it is possible to devise, and no branch of the revenue seems to be conducted in so unsatisfactory a manner. The Stamp Office occupies a large modern building in Waterloo Place, Regent Bridge, being the central edifice in the pile west from the arch. It is of four stones in height, and is only distinguished from the contiguous erections by the king's arms in relief on the summit.